For the first time, get the entire C series! Seven books, one low price! Save over 25% when you order this bundle. Bought individually, these seven books would cost 76.93. But in this bundle they are over 25% off at 56.99! The Darkenfold Forest, old, twisted and mired in the murmured rage of a time long gone, is a refuge for all the malcontents of the world. Those who seek to escape governance, both good and ill, wild creatures and monsters of lore, the hunted and the hunters, all find comfort in the darkening fold. Lost in the dark-cast wood are ancient ruins, dungeons and keeps, magic and treasures untold. It’s a land ripe for adventure, ripe for riches, ripe for glory. 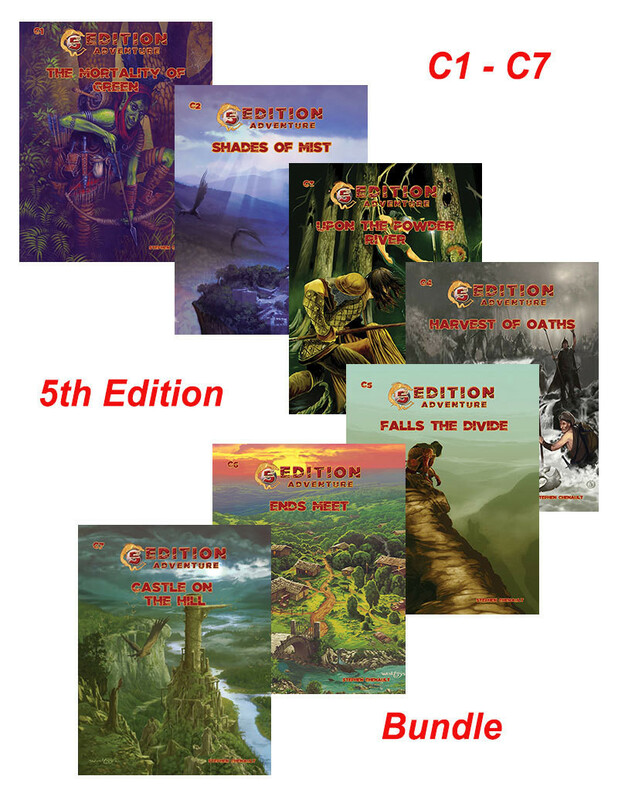 Beneath the Canopy Green is a boxed set that includes 7 adventures: C1 Mortality of Green, C2 Shades of Mist, C3 Upon the Powder River, C4 Harvest of Oaths, C5 Falls the Divide, C6 Ends Meet, and C7 Castle Upon the Hill. It is series of mid to high-level adventures for a party of 3-6 characters. These adventures are loosely strung together and include overland and dungeon adventures that range from pursuing monsters to to pitting the character’s strengths against and ancient wizard.